Aluminum and more. Huawei has sent a stylish phone to our lab: An aluminum casing available in three different colors, quad-core SoC and a slim profile. Huawei's P6 should convince across the board with that, shouldn't it? It has become a fact that Chinese manufacturers are almost on a par with Samsung, Sony and Co. in terms of build quality and the overall impression of their smartphones. Huawei has proved this again and again in the last months in our tests. 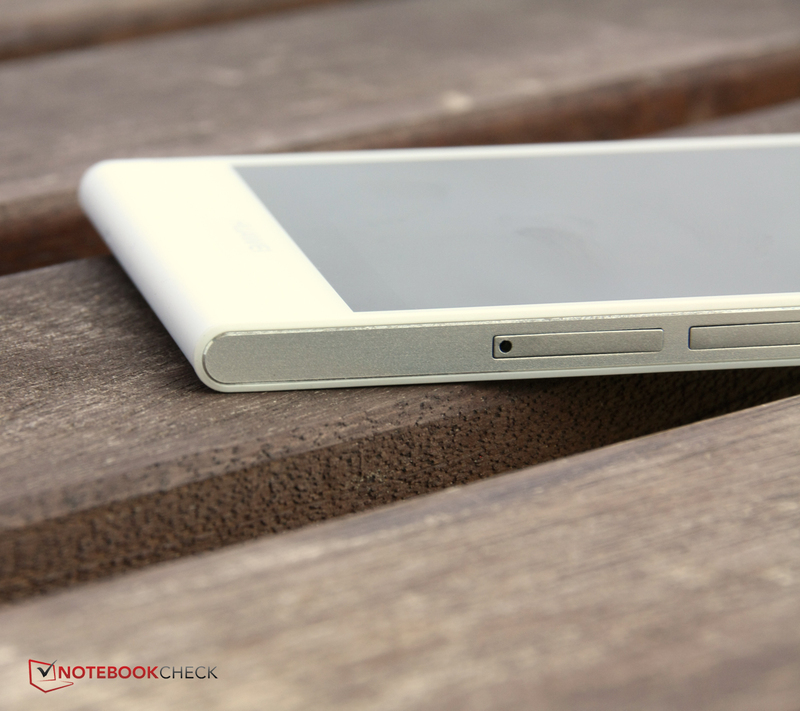 The Ascend P6 could successfully boost it to the front row of smartphone manufacturers once and for all. This looks quite good at first glance. 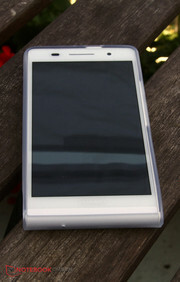 The phone features stylish looks, is pleasant to hold and it is light and thin. Huawei even speaks of the slimmest smartphone in the world. The self-appointed high-end smartphone also convinces with its quad-core SoC and the comparatively low starting price of 449 Euros (~$598). 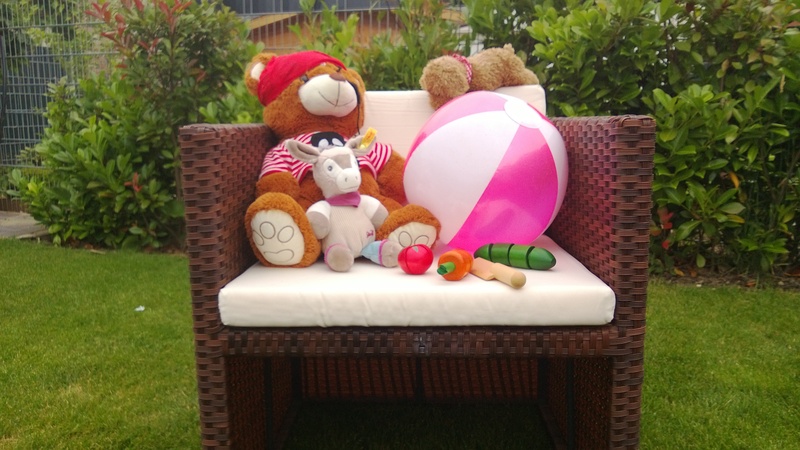 We compared the smartphone with premium range smartphones to find out what Huawei offers for this price,: Google's Nexus 4, the iPhone 5, Sony's Xperia Z and Xperia ZL, Samsung's Galaxy S4, HTC's One and LG's Optimus G. However, since the price range corresponds more with devices from the midrange, such as Nokia's Lumia 820, Samsung's Galaxy Express or Sony's Xperia T, we will also include them in our comparison. The casing resembles Apple's design language to a certain extent. 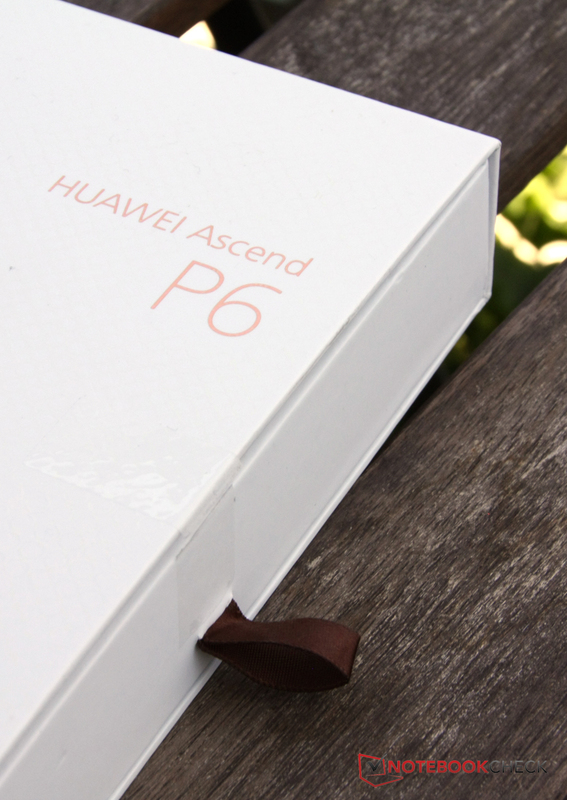 The first thing that struck us was the packaging of Huawei's Ascend P6. Samsung's S4 comes in a somewhat eccentric packaging in a wooden design and both Apple's iPhone 5 and Google's Nexus 4 appear in a rather conventional rectangular box, Huawei takes a different approach. 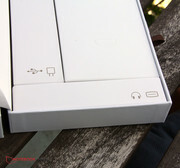 The user is confronted with a sleek white box that looks like a high-quality DVD or book slipcase. The inner part is pulled out via a small textile loop on the right. 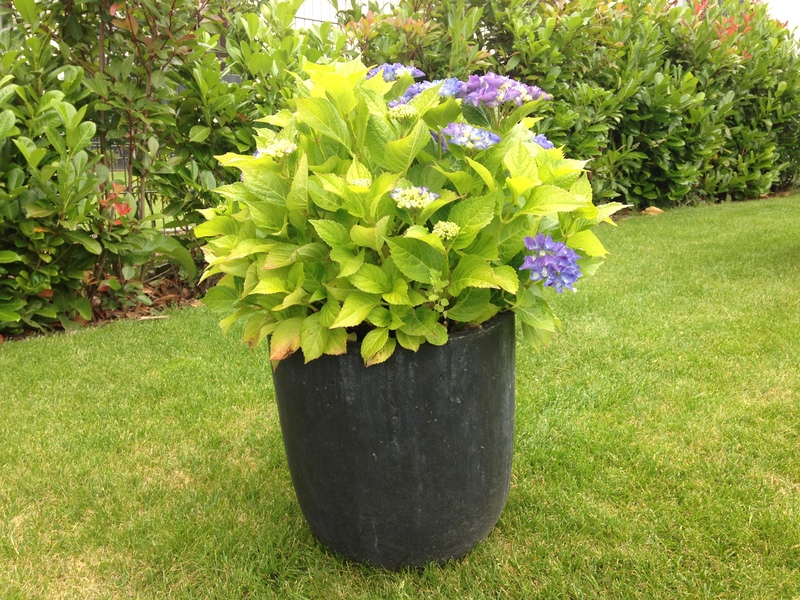 The package makes an overall high-quality impression. A black, pale pink or, as in our case, white phone featuring a 4.7-inch screen awaits the user after unboxing. The chassis is almost completely made of aluminum that runs around the lower edge in an elegant arc. 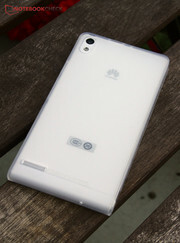 Huawei applies a protective pane of Gorilla Glass on the front. 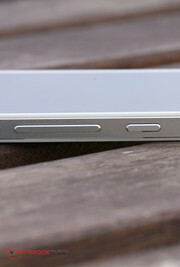 When looking down from the upper edge, the user might think that the designers have been inspired by the iPhone. The silver-colored, encompassing bezel and rounded edges speak for this. 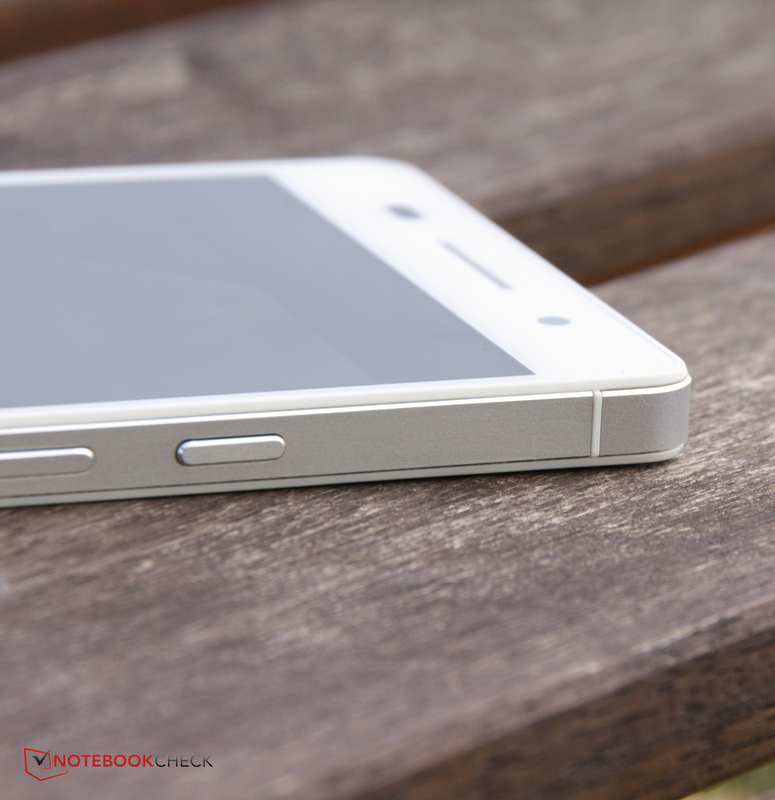 However, the rounded lower side and the slightly angular feel give the Ascend P6 enough individuality. The phone is comfortable to hold although a few hard edges do not really make it a hand-charmer. 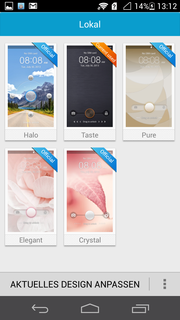 Samsung does a better job with its rather organic forms on the Galaxy S4. 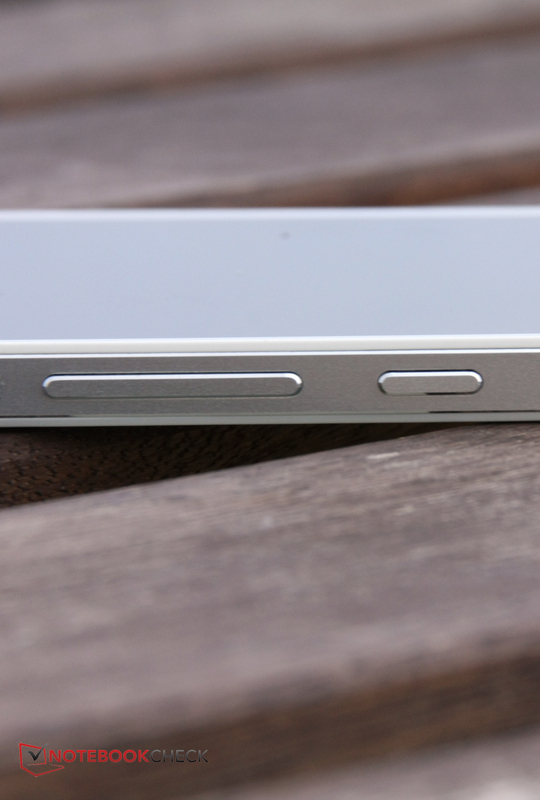 The phone's slim profile is truly remarkable. In fact, Huawei's P6 is the slimmest smartphone that we have ever tested. 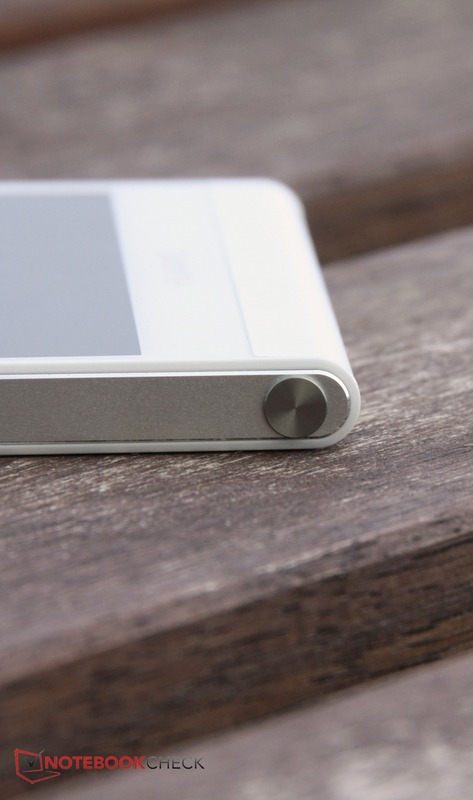 It is only 6.18 millimeters thick and thus more than 1.4 millimeters thinner than the iPhone 5. Our review sample is a bit heavier than the ultra-light 112 grams of Apple's smartphone. However, 120 grams is still enough for an impressive second place. Also, the casing is very rigid. Only high pressure on the back becomes visible to a small extent on the screen. The interfaces also feature a few peculiarities. For example, the USB 2.0 port is not found on the bottom as in many cases but on the phone's top. In our opinion, this is no problem in landscape mode but the cord wouldn't be quite as interfering on the bottom in portrait mode. The user will likely first have to look for the audio jack because it is hidden behind a metal flap on the left. This flap is also conveniently used as an eject tool for the micro-SIM card and micro-SD card on the right. Many things can be customized in the Emotion UI. 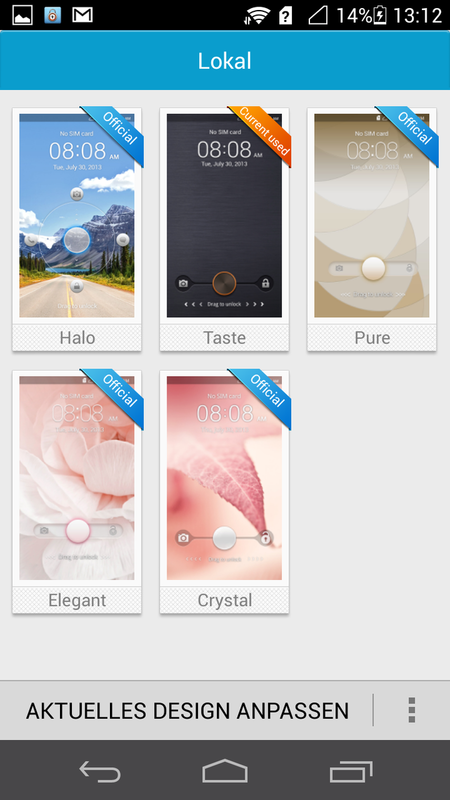 Huawei installs Android 4.2 with its proprietary user interface "Emotion UI 1.6". The user interface's colors match the casing's color. 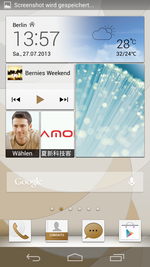 This was a light-colored background and gold-brown logos in our white device. The looks can be quickly changed via the app "Designs" and even be customized although the elements are always tied to the installed templates. 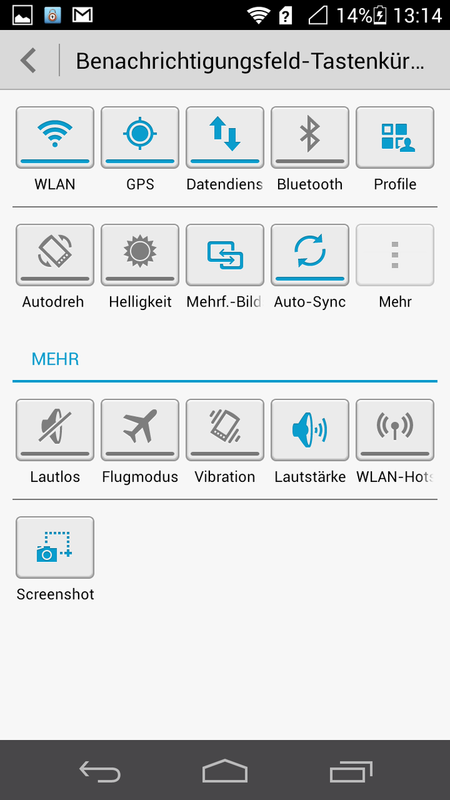 The Emotion UI 1.6 offers the usual Android combination of widgets and logos on the screen. 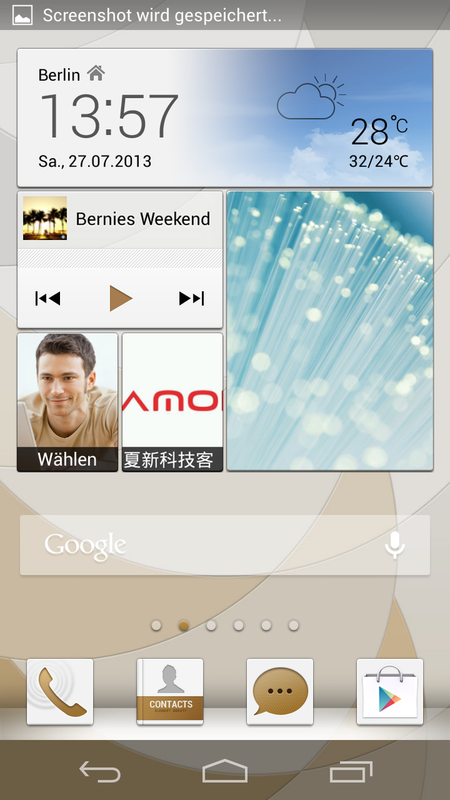 The centerpiece is a big widget on the home screen where contacts for speed dialing, audio player or slideshows can be integrated. 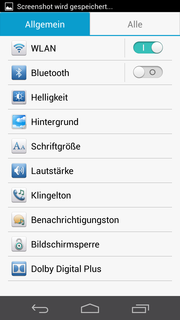 Folders for categorizing apps can be created and many features can be disabled and enabled via the quick access tool bar. 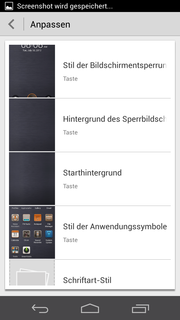 Apps are always located on one of the right or left screens; there is no "show all apps" feature. Convenient: New apps are marked by a banner on the icon. 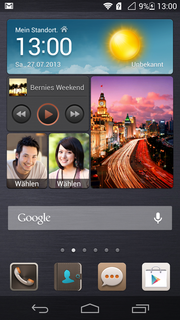 Emotion UI generally includes some graphical as well as some substantial changes that alter the utilization of Android. The system can be used very intuitively. 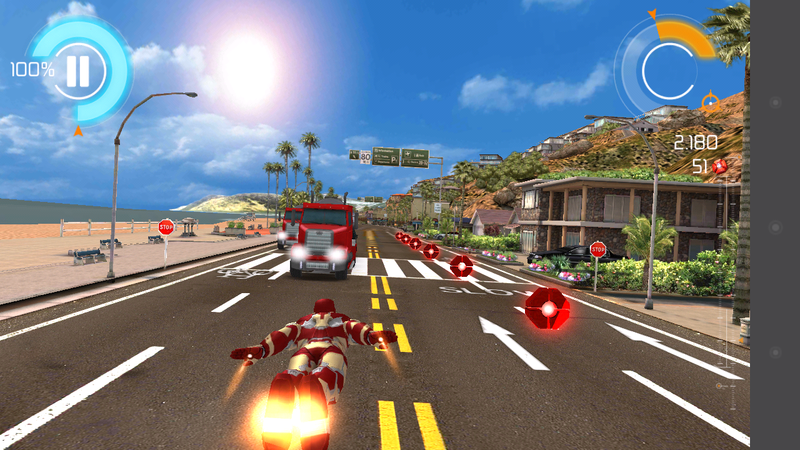 Huawei includes the free game Riptide GP that is a lot like Wave Race from Nintendo 64. Besides that, Polaris Office 4.0, a video editing app and a few small helpful programs are installed, which add up to an overall decent software bundle. One thing first: Huawei's Ascend P6 will currently not be an option for users who are looking for a phone featuring LTE support. The smartphone supports four different radio bands in the GSM range and five different UMTS radio bands but HSPA is the fastest possible wireless standard. 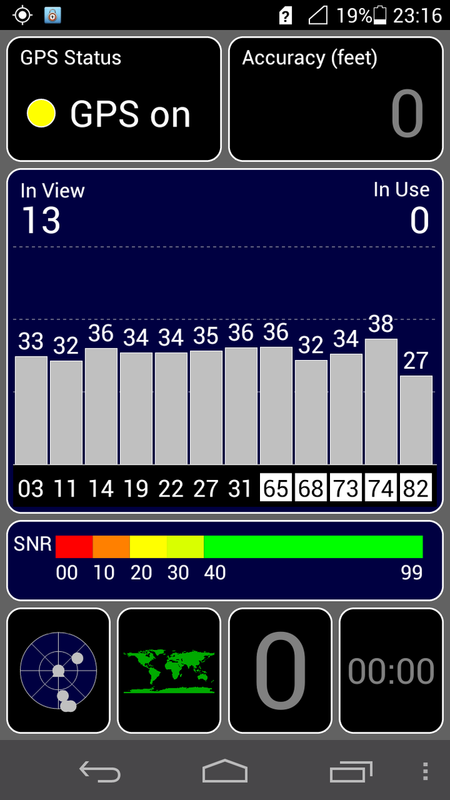 We had a very good reception in the D1 network in both the 3G and the 2G network. A Wi-Fi module that sends and receives in the 802.11 b/g/n standard is also installed. The module displayed a good signal strength with three out of four bars at a distance of ten meters from the router and through three walls. Only Bluetooth version 3.0 is available although a more current standard exists that is superior particularly in security issues. 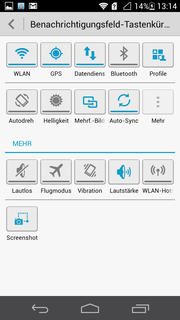 In addition to support for the DLNA standard, other wireless interfaces such as NFC are also not installed. 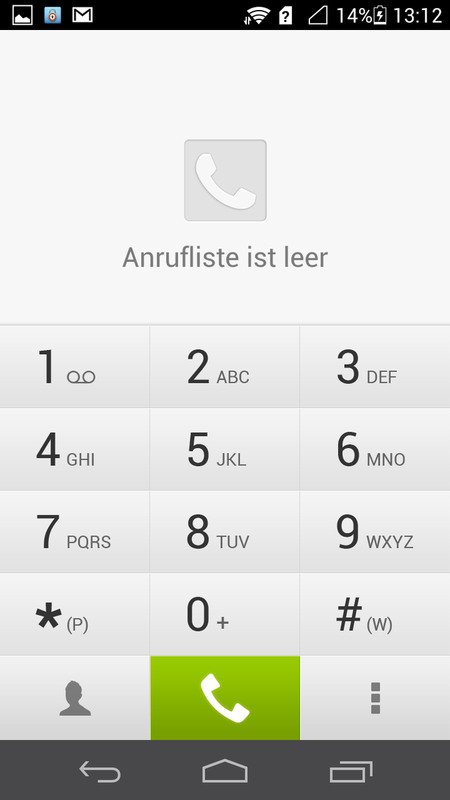 The phone app's design differs quite strongly from the standard Android app. 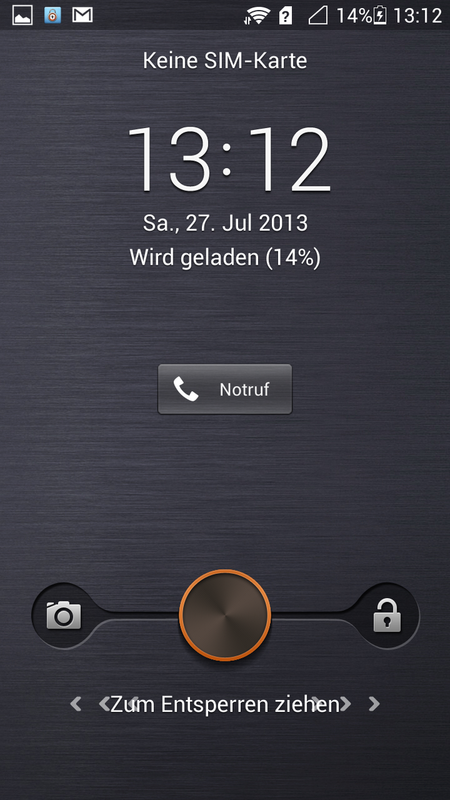 However, its bright green dial button doesn't really fit in to the very restrained style of the Emotion UI. 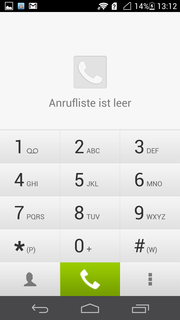 However, the app is quite easy to use and allows switching between contacts, dial lists and the dialpad quickly. We found the speech quality to be very good. 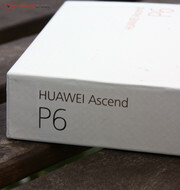 The called party came across very loud and clear on Huawei's Ascend P6 and our voice was also perceived as clear. 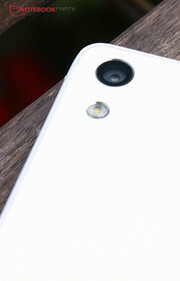 Huawei particularly highlights the installed cameras and it wants to score with the 5 megapixel front-facing camera. In fact, no other smartphone features such a high-resolution front-facing camera since it is usually only used for video calls. However, Huawei promises that it makes the "best self portraits" possible. The 8 megapixel rear-facing camera is on a par with most current high-end phones. Sony's Xperia Z and ZL models offer 13 megapixels and Nokia's new Lumia 1020 comes with a 41 megapixel camera. But not only megapixels are important for picture quality. The image sensor, lens and the picture processing in the casing are also vital. 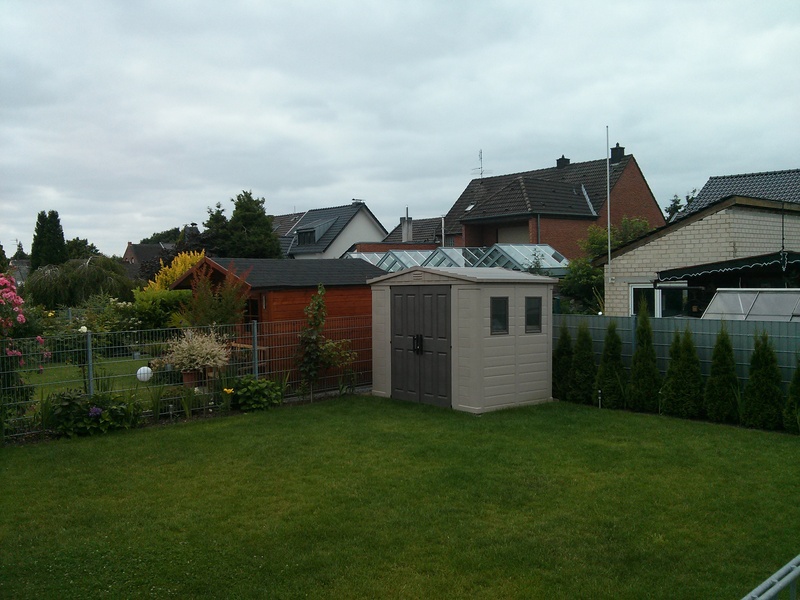 The overall result of both cameras in Huawei's Ascend P6 is quite impressive. 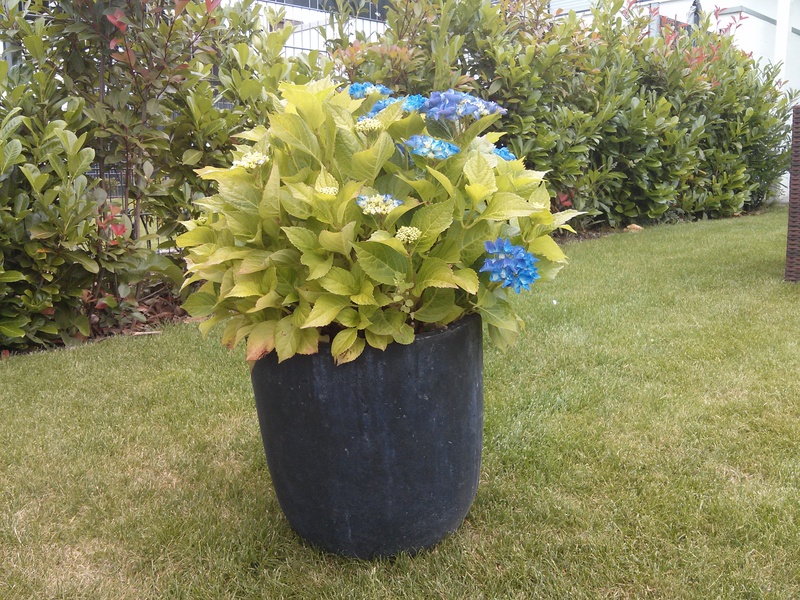 Image details are rendered accurately, colors are rich but not overemphasized and bright areas are not overexposed. Both cameras take acceptable pictures even in unfavorable light, although they show a certain degree of color noise. Nevertheless, they are still very appealing for smartphone cameras. Huawei is quite generous with accessories. 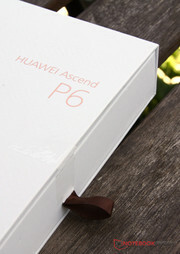 The stylishly lettered and clearly arranged boxes beneath the smartphone contain the power supply, USB cord and a protective sleeve in the matching color for the phone. Of course, the usual quick start guides and even a headset are included. 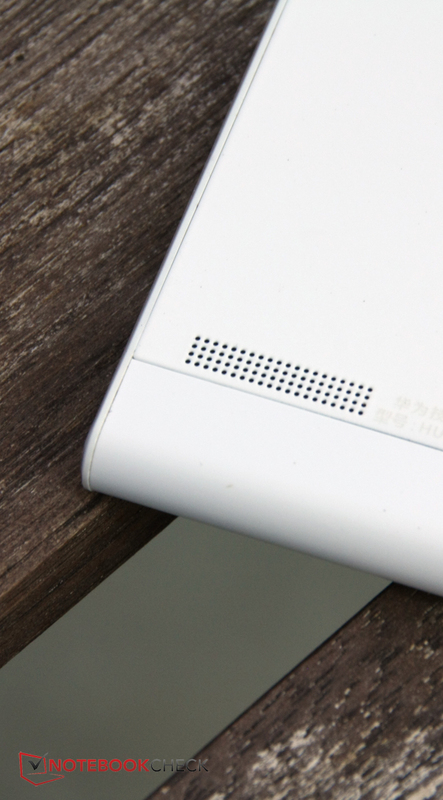 The phone itself sports the flap for the microphone port which is also the eject tool for the SIM and SD cards. This is actually a clever idea but a place for the flap always has to be found when on the go. A defect device can be sent in for 24 months and will come back repaired or replaced. 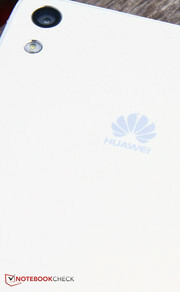 Huawei has a good US website where hotline numbers and contact forms or links to service providers are listed. Service orders can also be placed online for the latter. changes depending on the input field. The touchscreen's operation is excellent and accurate. It also supports multi-touch gestures using up to 10 fingers at the same time. The buttons on the casing's right make a very high-quality impression and feature a clear pressure point. Although the keyboard looks a lot like Google's default Android model, Huawei has modified the details to a great extent. It changes depending on the field that an input is made. 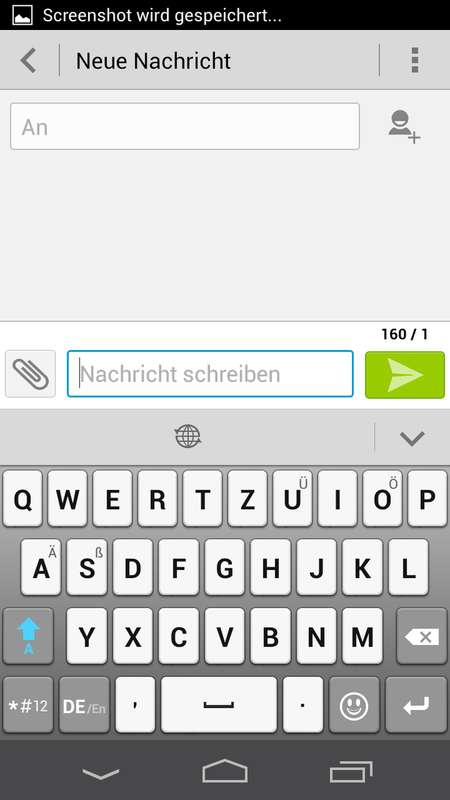 For example, when entering a name in the message app, digits can be accessed by pressing the upper letter row for a longer time. 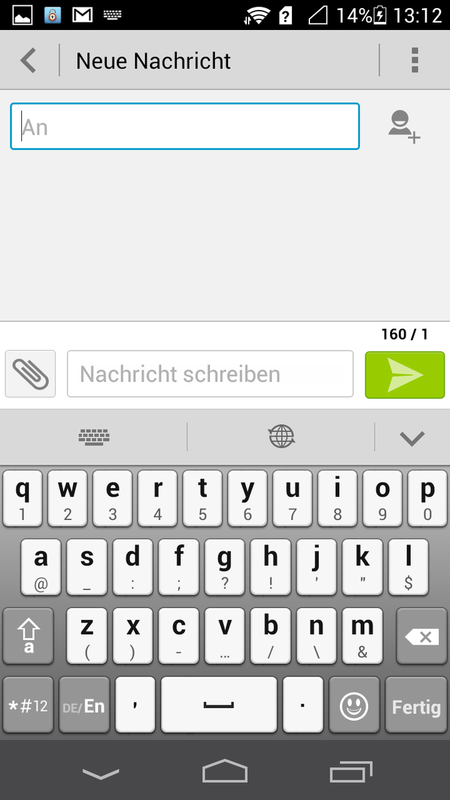 When the same app is used for writing a message, the keyboard only offers a few options and allows easier typing. Voice input or handwriting detection are not available here but changing the language or inserting smileys is implemented quickly. 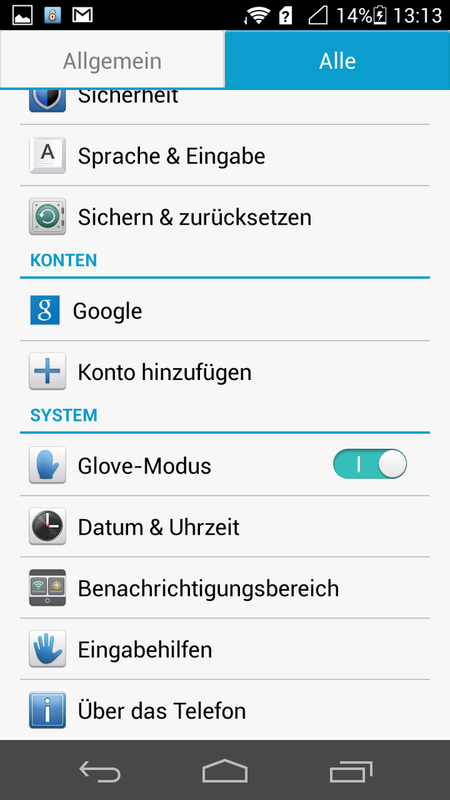 A so-called "Glove Mode" enables using the phone with gloves. That actually works quite well after the smartphone learns that it has to increase its responsiveness. The motion controller offers the usual options like turning the phone to mute or holding it to an ear to answer a call. 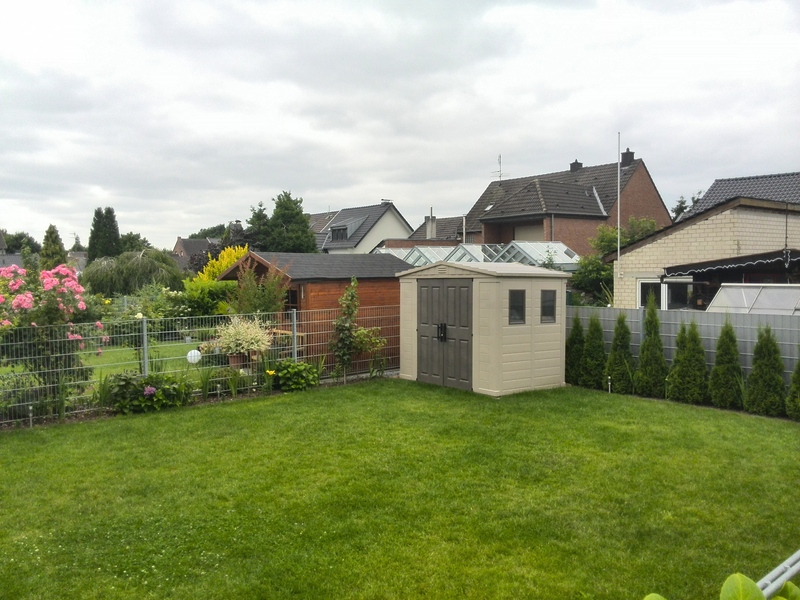 The overall use of Huawei's P6 is very good. However, users who like diverse input options will be disappointed. In contrast, Samsung's Galaxy S4 offers a real torrent of options. The 4.7-inch screen in Huawei's Ascend P6 is based on IPS+ technology and has a rather low resolutionof 1280x720 pixels. Of course some other premium devices, like Google's Nexus 4 or Apple's iPhone 5, do not feature a higher resolution either, but slightly more up to date phones, such as Sony's Xperia Z, HTC's One or Samsung's Galaxy S4, clearly show that a Full HD screen is now a must in this sector. Naturally, the sense of such a high resolution on a relatively small screen is doubtful. The images on Huawei's Ascend P6 look razor-sharp and single pixels are not visible. Huawei does not blunder with the maximum brightness and achieves an average of 486.8 cd/m² which is exactly on a par with the iPhone 5. 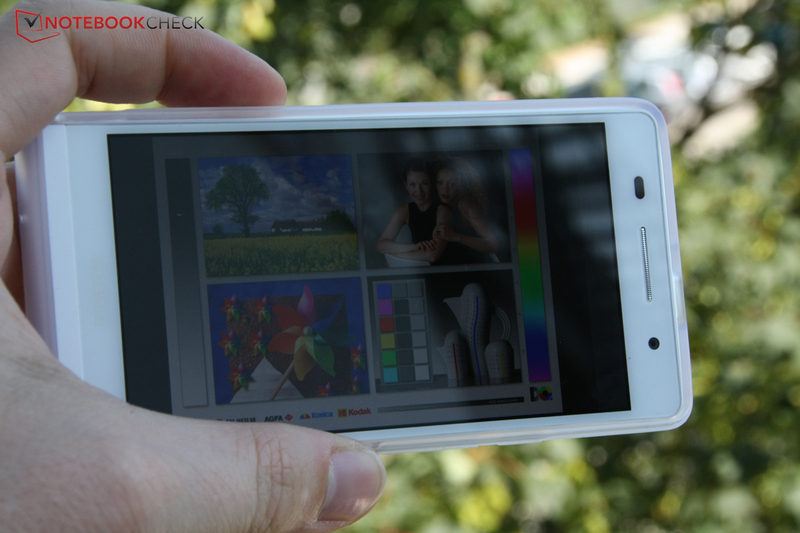 Consequently, Huawei's Ascend P6 features a very bright screen. The illumination of 92% is also very homogeneous but not quite as accurate as in the iPhone 5 or Nexus 4. 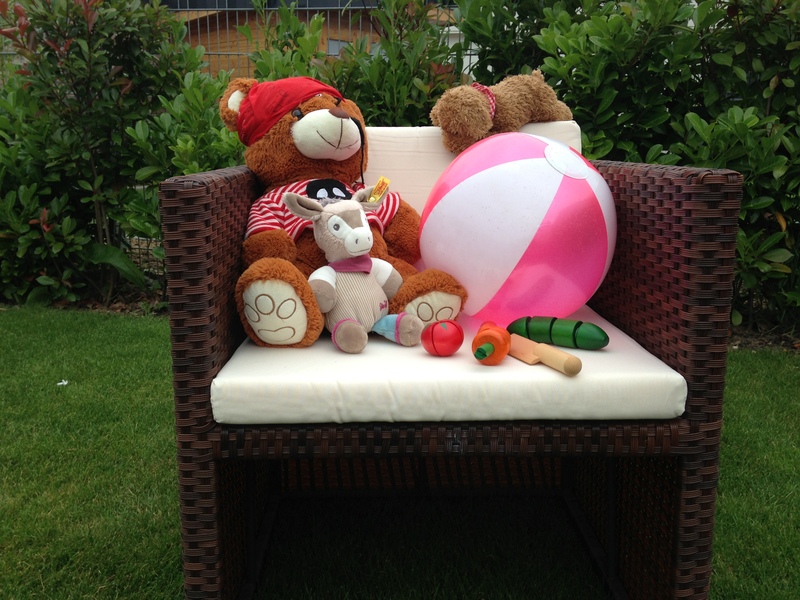 The contrast of our review sample is not as high as the iPhone 5, Google Nexus 4 or Sony Xperia Z contenders. Nevertheless, 860:1 is still a decent rate. The black value is also a bit higher than in the mentioned devices but 0.58 cd/m² is still acceptable. Subjectively, the image even makes a very good impression. Black areas look saturated and do not show visible brightness differences and colors look crisp. One special feature is found in the settings menu. 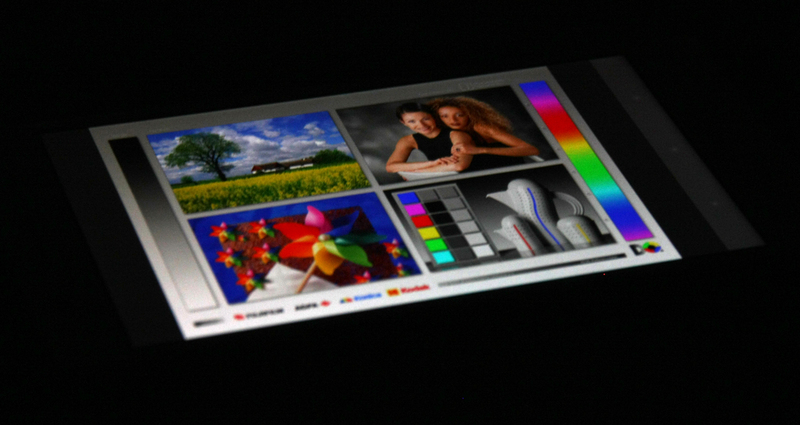 It is not only possible to manually adjust the brightness, the color temperature can also be changed when desired. 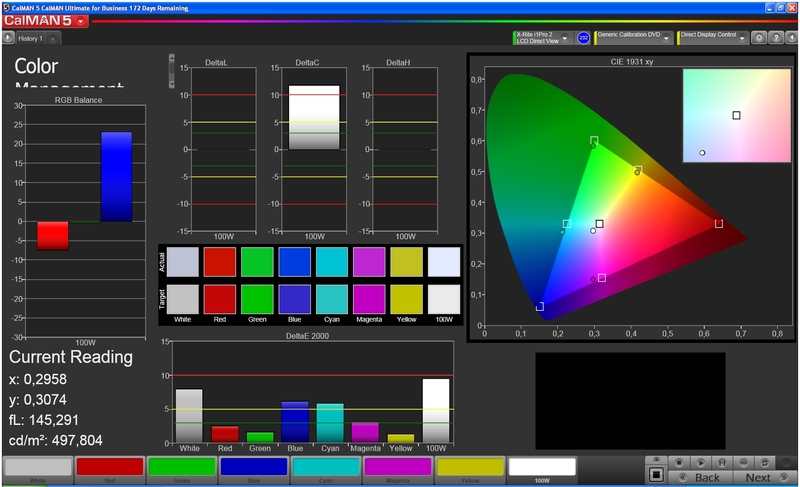 Thus, it is possible to customize the color reproduction and also align it quite close to the reference color spaces. 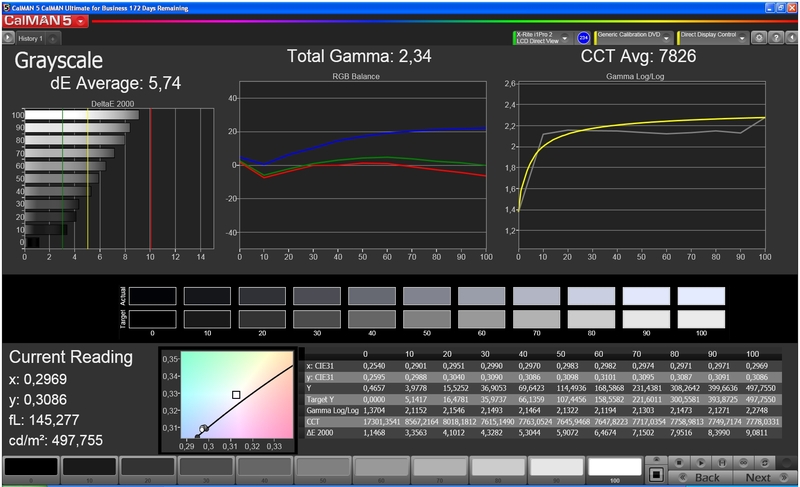 In our test with the colorimeter and CalMAN software, we achieved much more accurate rates than in the default settings by setting the color temperature control to approximately 20%. The average DeltaE rate, so the deviation from the sRGB color space, dropped from 5.31 to 3.54. 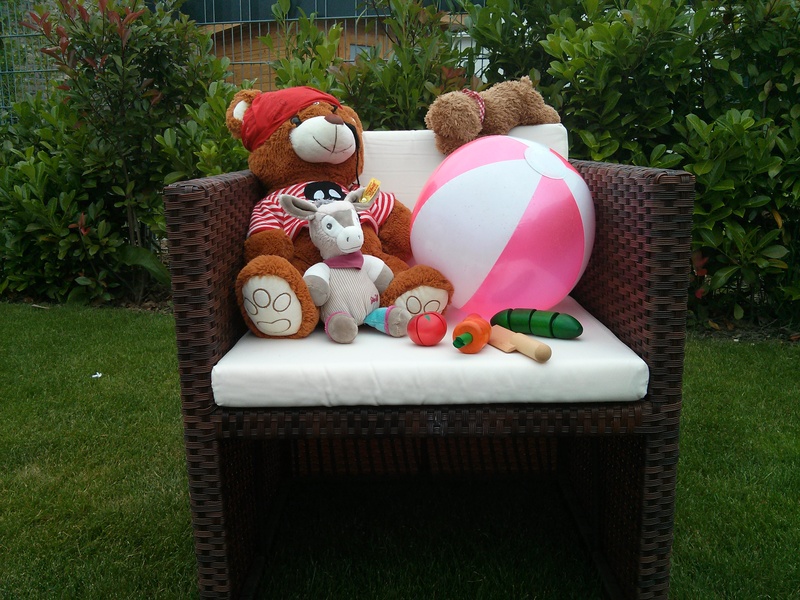 Although this is not quite as good as Samsung's Galaxy S4 in the setting "Video" mode, the rate is very good. 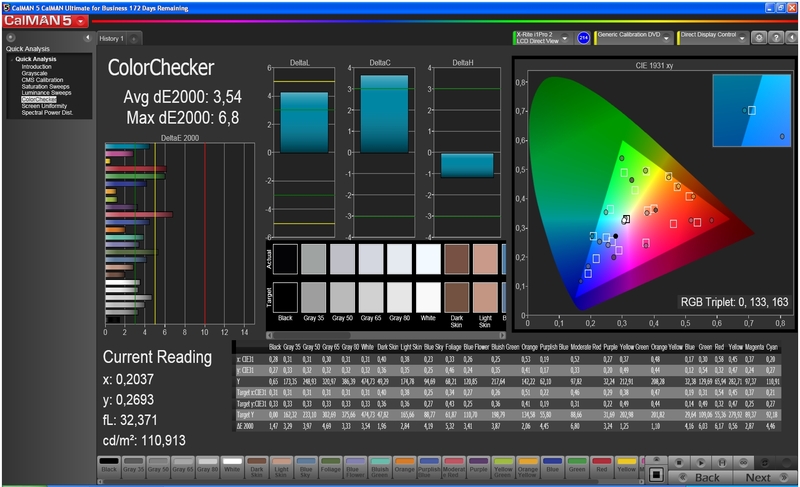 The grayscale accuracy is even better with the 20% setting of the color temperature control. Everything is then within the green field of the deviation. The high brightness enables a relatively good view of what is happening on the screen even in very bright sunlight. However, the eyes are strained after a while so that a place in the shade is recommendable. 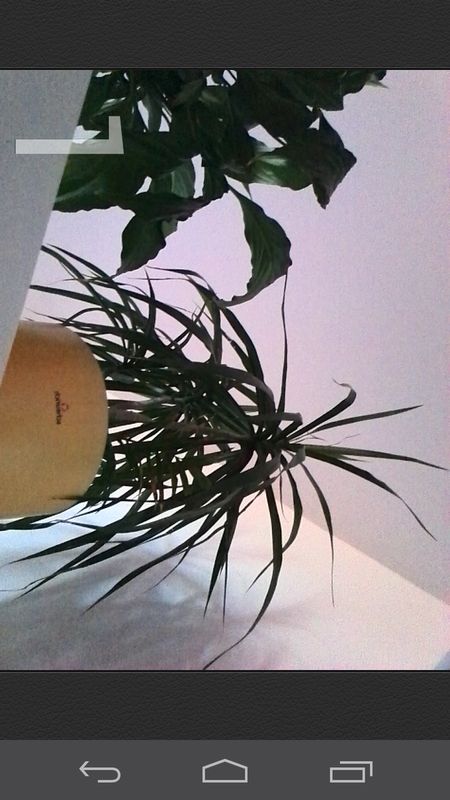 A considerably lower brightness setting is sufficient to see the content clearly indoors. The automatic brightness control works quite reliably here. 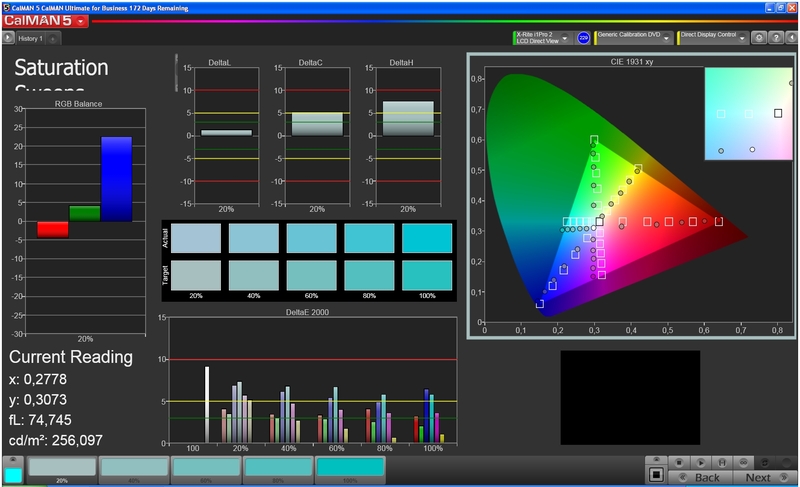 The screen's underlying IPS technology makes it possible to view the image without brightness losses or contrast deviations in the most acute angles. The picture remains clear and well-legible when looking at the screen from a very flat angle. HiSilicon Technologies is named as the SoC's manufacturer, but the company is a subsidiary of Huawei. The HiSilicon k3v2 Hi3620 SoC installed in our review sample clocks with the maximum specified clock rate of 1.5 GHz. 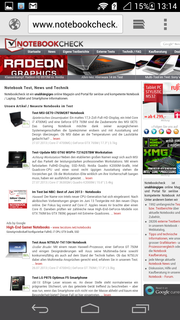 It features four computing cores and was launched in early 2012. That this is almost an eternity in the fast-paced smartphone market can be quickly seen in the benchmark scores. Particularly HTC's One and the Galaxy S4 clearly set themselves apart in terms of system performance. Only Samsung's Galaxy Express lags behind marginally. A look at the processor's pure power using Linpack quickly proves that the SoC does not stand a chance here against modern phones. Premium smartphones partly surpass it by a factor of seven. Again, the Ascend P6 is more on a par with the Xperia T and Galaxy Express and consequently in the midrange. However, stutters are very rare in practical use. 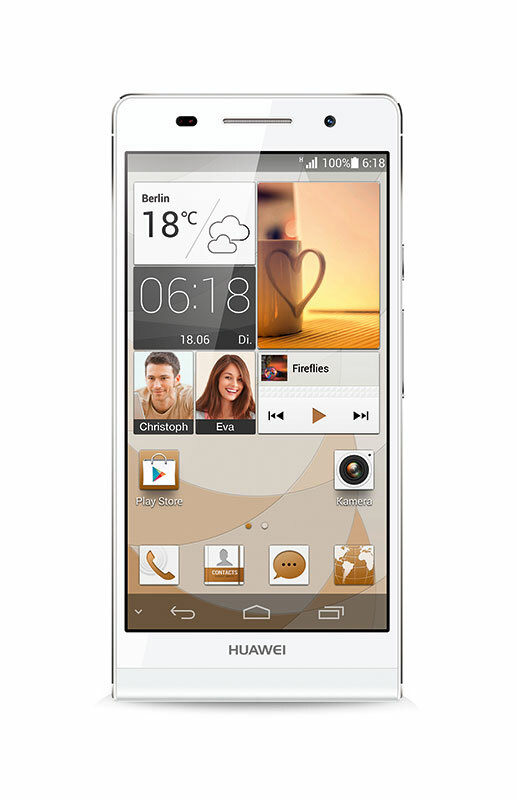 Huawei's Ascend P6 is perfectly equipped for navigating through the operating system and not at all slow. 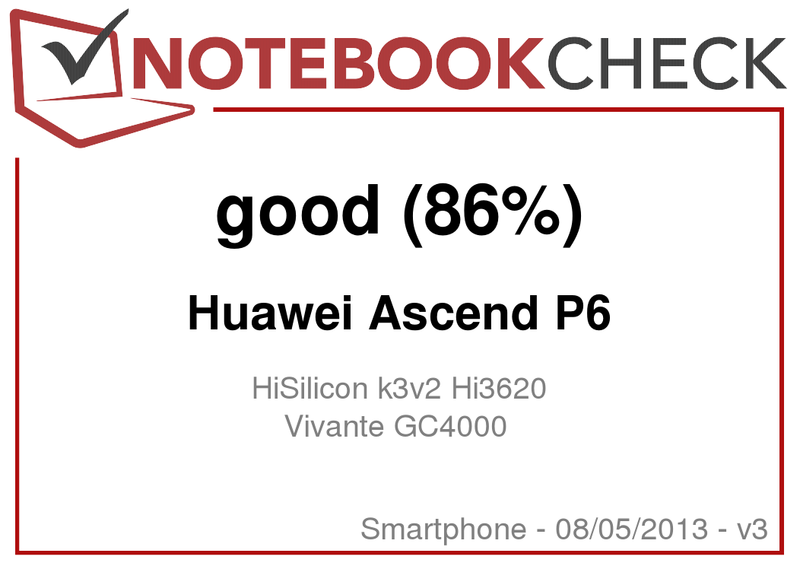 The "poor" scores in this part are rather due to Huawei's own claim that the Ascend P6 can compete with other premium smartphones. 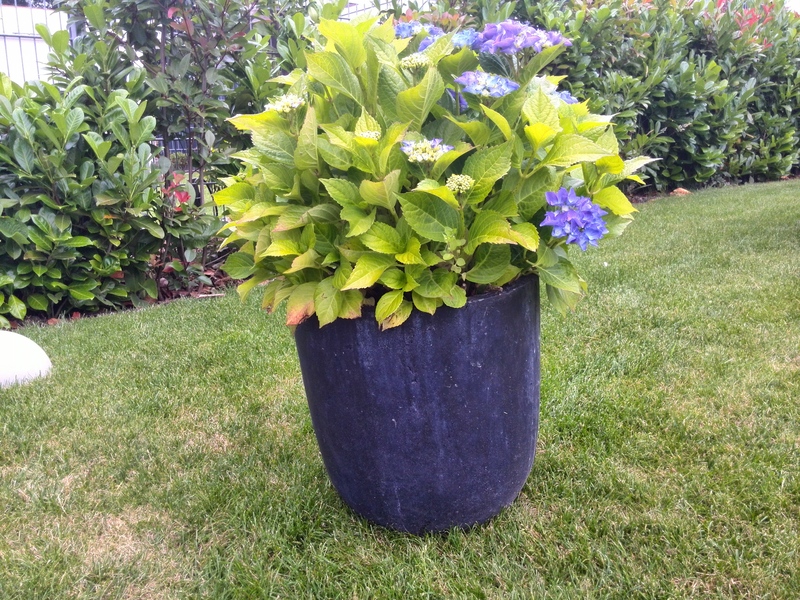 This looks similar in the synthetic 3D benchmarks. The system can only keep up with the midrange smartphones to some extent. But even the Galaxy Express achieves a higher performance of at least 50% in the benchmarks. 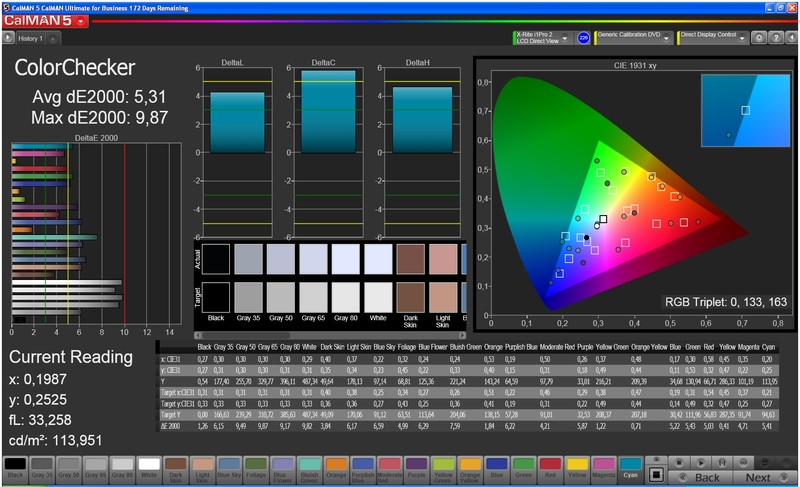 Huawei states that the graphics unit calculates with 16 cores, which is likely to only look good on paper. We checked what the performance looks like in real games further below in "Games". Huawei's Ascend P6 also lags behind in the browser benchmarks. The Galaxy Express, as the slowest contender, is twice as fast in some cases. 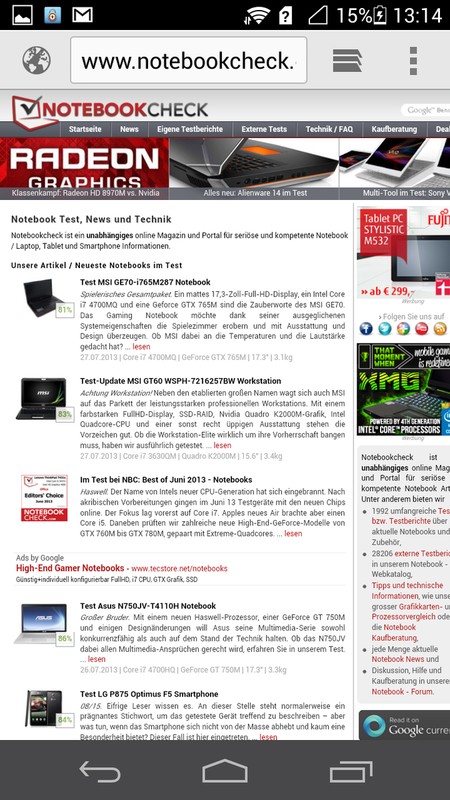 This is noticed in the partly slow page loading and lower performance, for example, in HTML 5 videos and animations. The performance is just still acceptable for occasionally browsing on the internet on the go but users who use mobile internet more intensely will find considerably faster phones. This pattern is continued with the internal storage. The Ascend P6 seems to access the 8 GB much slower than all compared devices. Sony's Xperia T and Samsung's Galaxy Express are once again the next fastest phones; all premium smartphones have a large lead. As we observed in the synthetic 3D benchmarks, the graphics unit integrated in the SoC is not the strongest of its kind. At least the included and very fun Riptide GT runs with nice graphics and almost always smoothly. However, this looks different when other games are downloaded from Google's Play Store. 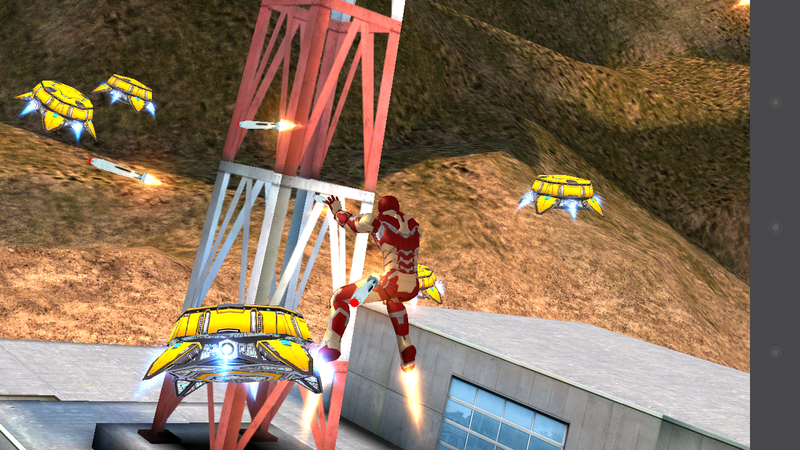 Iron Man 3 is playable but stutters noticeably and also produces the odd graphics bug. 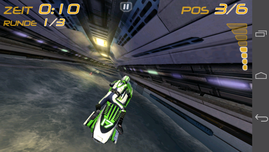 The power is enough for casual games like Angry Birds: Star Wars but the graphics unit is not very future-proof. The conductive metal chassis could dissipate the heat produced during use out of the case well. Then again, it could get quite warm. This is fortunately only true to a certain extent. A maximum of 42.3 °C is a higher rate than, for example, from the Galaxy Express or even HTC's One. However, this temperature is very limited to the backside's center right section and is only produced during full load. The temperatures even drop to below 30 °C over a large area in idle and the heat is barely noticed. 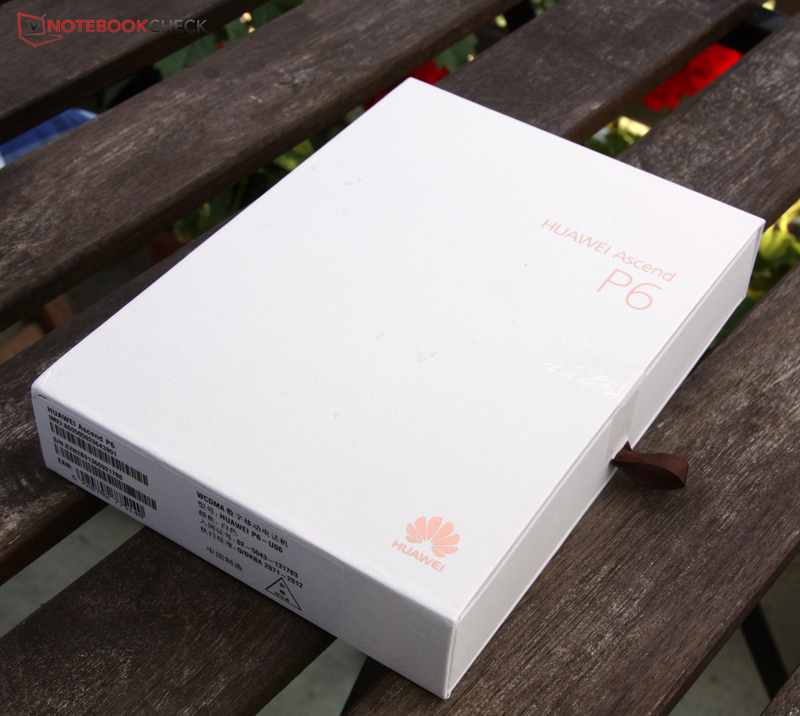 Of course, some smartphones reach a lower temperature and many of them are more powerful than the Huawei's Ascend P6. Nevertheless, the temperatures stay on an overall quite low and thus good level. The little speaker on the back might seem a bit unremarkable but it produces a very good sound for a smartphone. Trebles and mids are well defined, nothing overdrives and everything sounds balanced. Naturally, the low-ranges are very thin but the rest is quite worth listening to. Since the entire casing is used as a sound box, it does not even matter if the speaker is covered by a finger or the phone is placed on its back on a table. Settings for Dolby Digital Plus are available under the "General" menu tab. It audibly enhances the sound for music or videos. 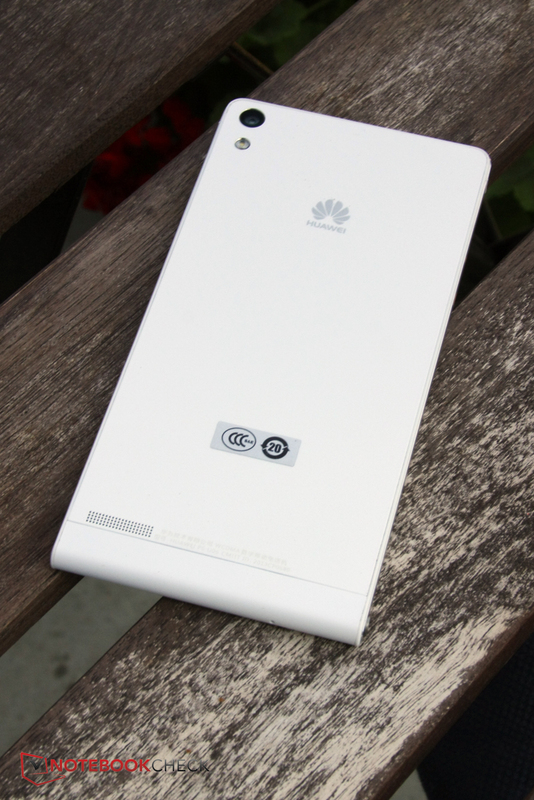 Huawei's Ascend P6 still consumes 0.8 watts from the mains when it is in standby. This is definitely too much and results in the battery draining faster than expected even when the smartphone is not used. 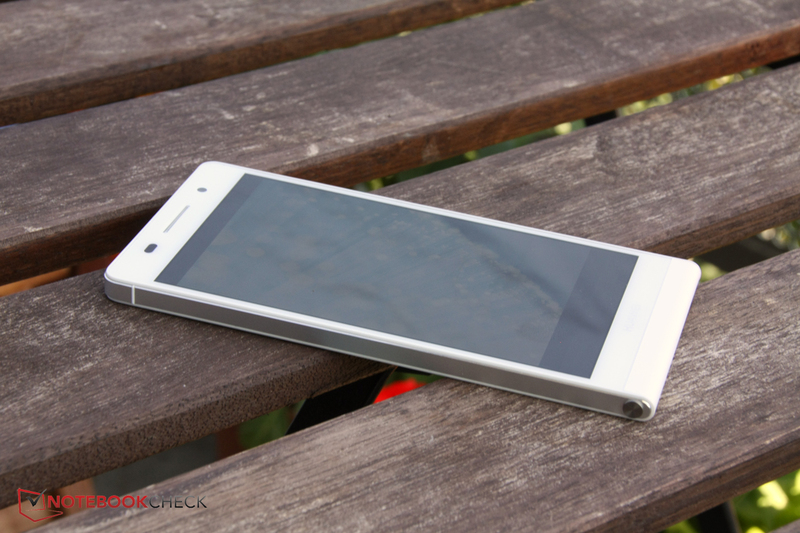 Huawei's Ascend P6 is not exactly energy-efficient in other regards either. It consumes a minimum of 1.3 watts and a maximum of 2.8 watts in idle. Google's Nexus 4 maximum idle consumption is 1.4 watts, which is only half the power. Huawei's Ascend P6 reaches a similar maximum rate as most other devices during full load, which is 6.1 watts. Compared with the admittedly slightly stronger Samsung Galaxy Express, the Ascend P6 is clearly defeated. Samsung's midrange phone has an absolute maximum consumption of 2.2 watts. 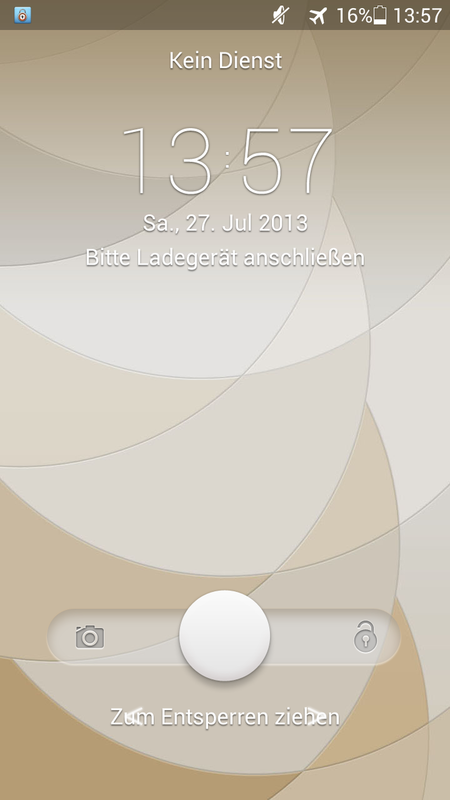 Another sign that the SoC in the Ascend P6 is no longer up to date. Correspondingly, the runtimes of Huawei's Ascend P6 are quite suitable. The user will survive the day owing to an idle runtime of 10:23 hours. Samsung's Galaxy Express clearly surpasses the just over six hours in the Wi-Fi test with 10:30 hours. All other smartphones we used for comparison could also surpass this by at least one or two hours. What is a premium smartphone made of? 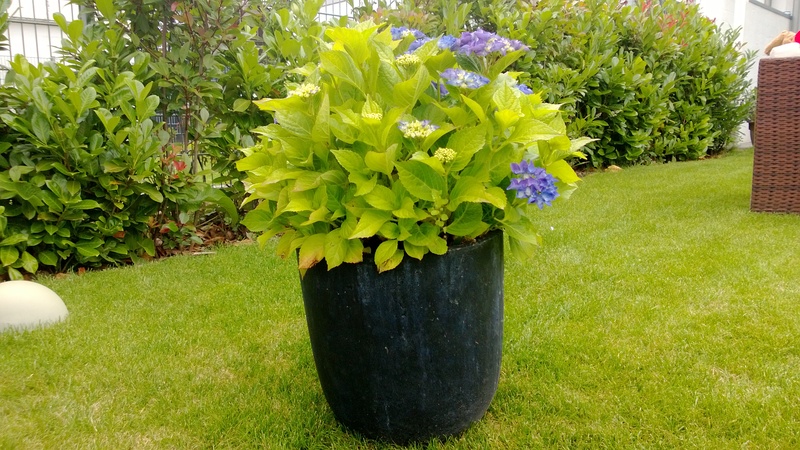 It is of course the sum of first-rate components that ensure a high-end and swift system. But there is more: This feeling that you are holding a piece of technology which is absolutely innovative and which opens innumerable possibilities. Huawei manages to create this feeling right away from the outside: The extremely slim, stylishly designed, high-quality and very rigid metal chassis is convincing. 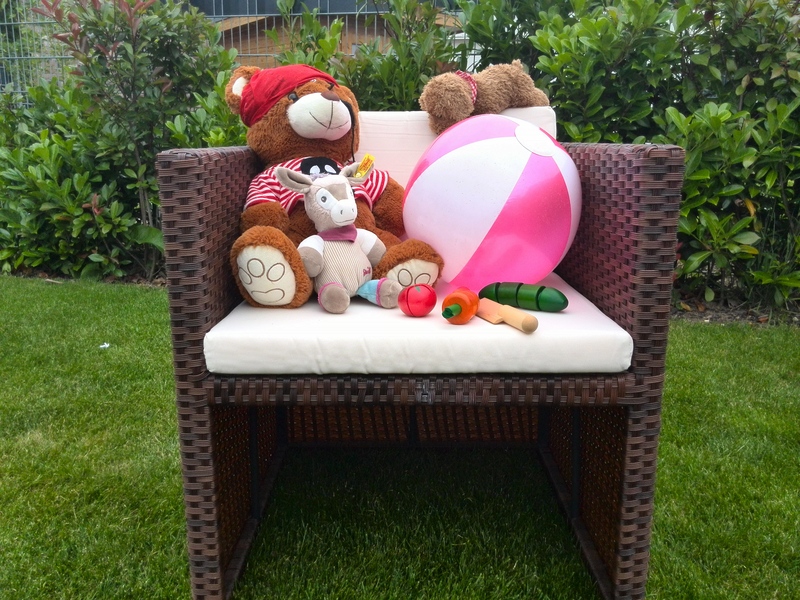 There are even three colors to choose from: pale pink, white and black. 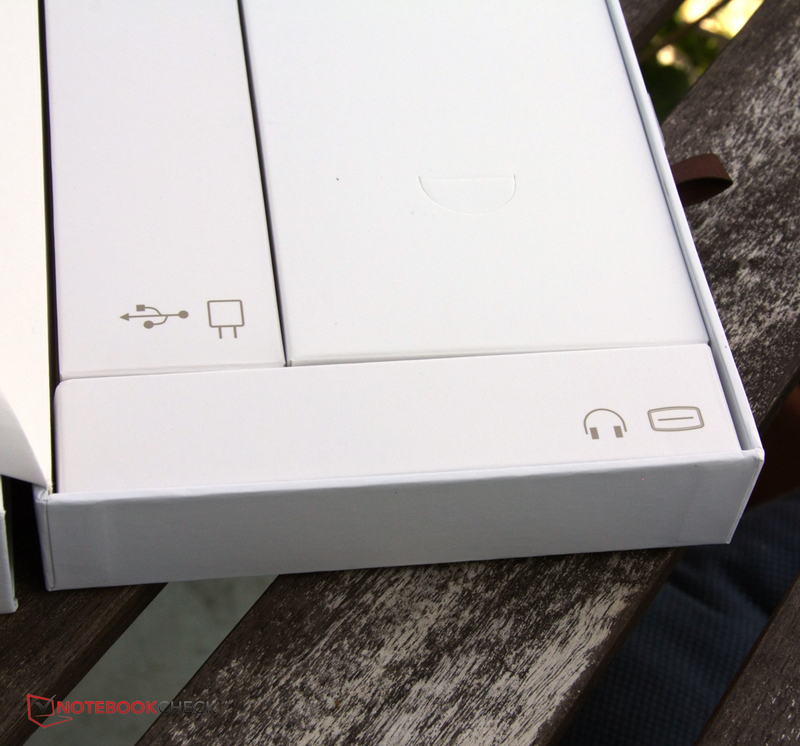 The elegant packaging also contributes to the A-one first impression. Then there is the good operation, clear speech quality, the consistently good signal strength of almost all modules, a lot of accessories and the decent software. 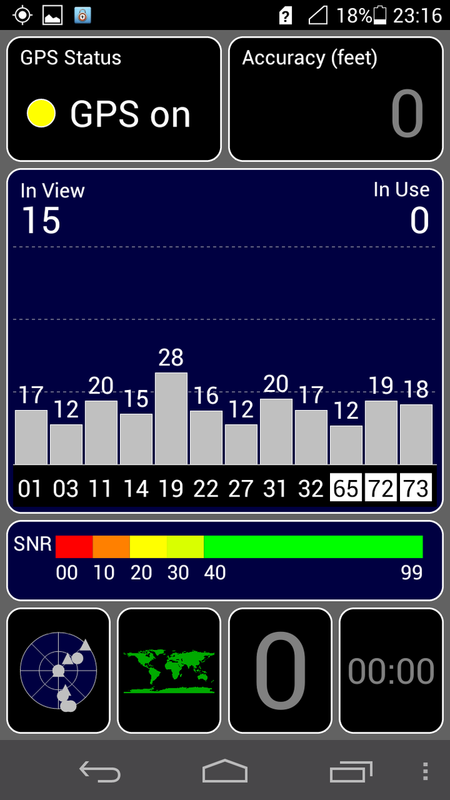 The low-resolution screen, the swift but ultimately weak GPS module and the lack of LTE support are negative points. 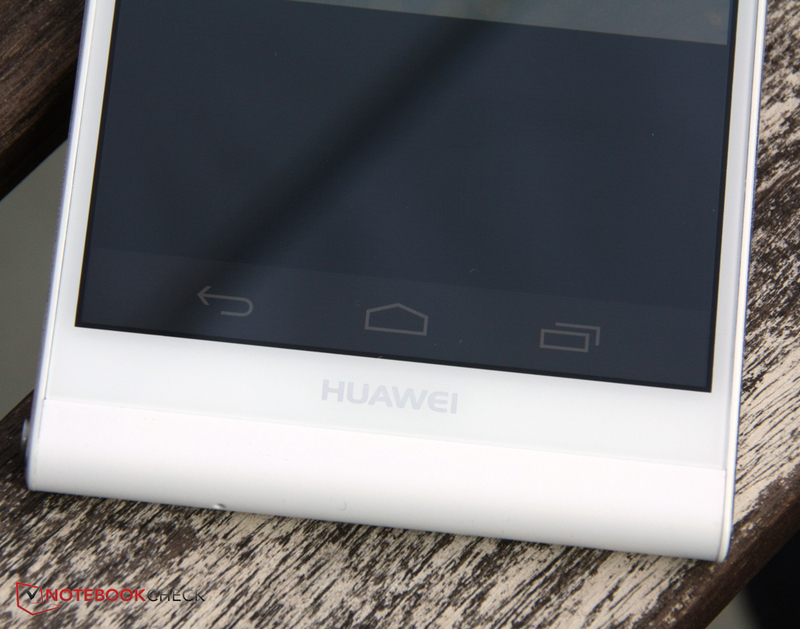 The money saved when buying Huawei's Ascend P6 is thus noticed. Above all in the power: The installed SoC is now simply too old to keep up with the current premium range. 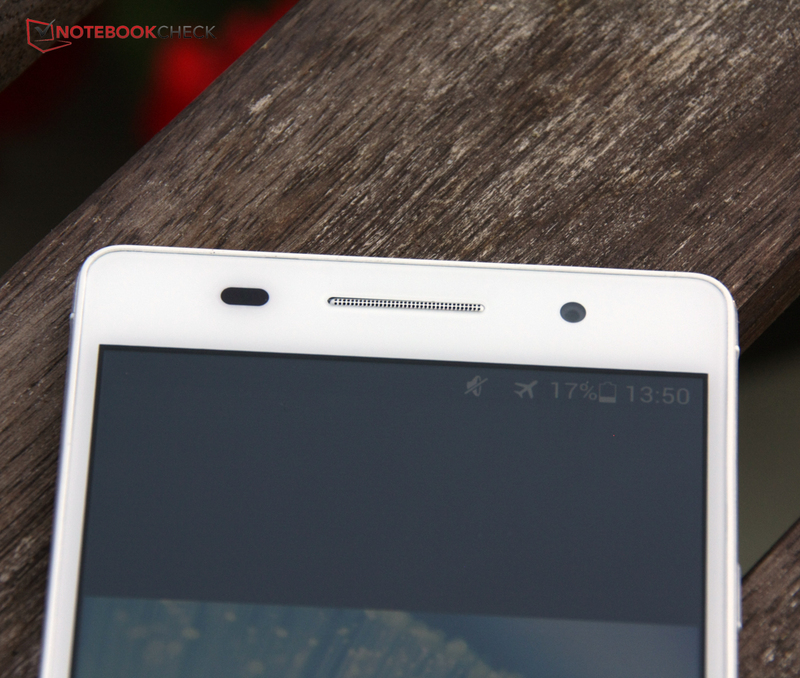 Overall, the Ascend P6 lags behind the current first league of smartphones in a few points. Nevertheless, it is an impressive phone but not only because of its very slim build and good workmanship. Users who do not need LTE or a Full HD screen and can accept a lower performance will get a good smartphone for just under 450 Euros (~$599), which is more located in the midrange than the premium range. 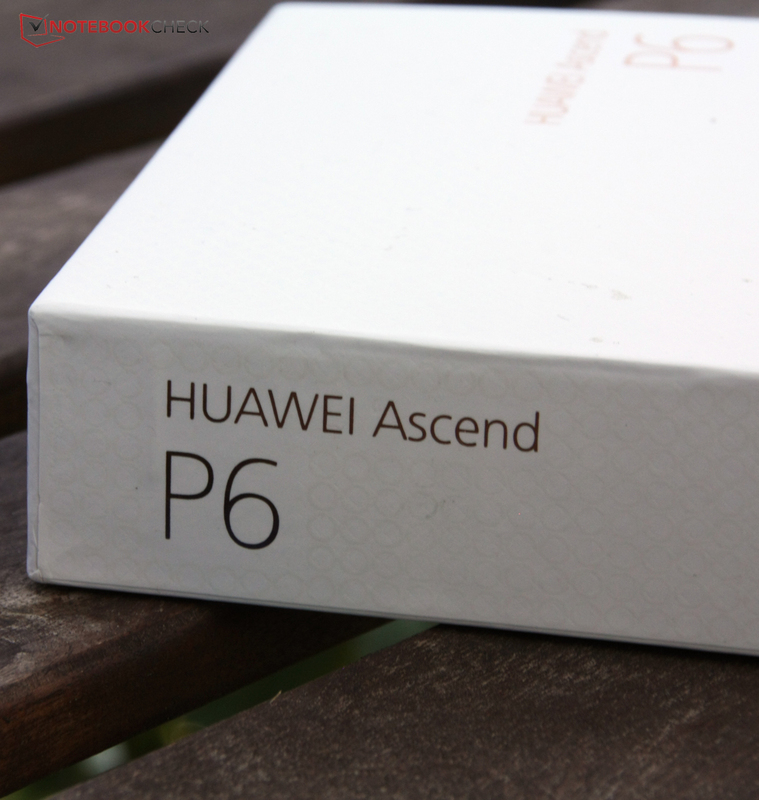 In review: Huawei Ascend P6. Review sample courtesy of Huawei. 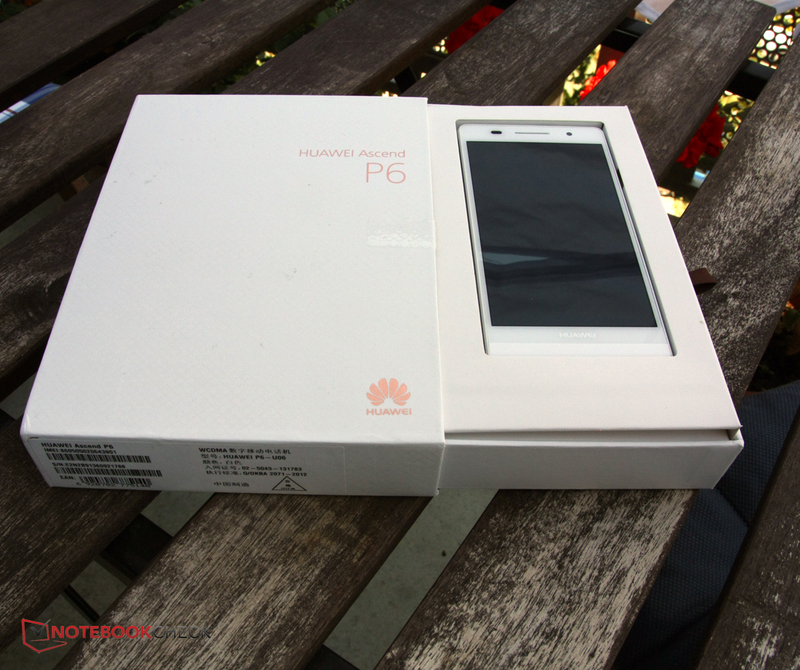 Huawei's Ascend P6 challenges premium smartphones. The boxing makes a very high-quality impression at the outset. and the device is unboxed. The quite diverse, clearly arranged accessories are found underneath that. Completely made of aluminum, quality build and rigid. The phone also has an extremely slim profile. The buttons are also high-quality and feature a good pressure point. A small detail in design and convenient: The flap for the audio jack wards off dirt and is also the eject tool for the SIM and SD card. Low-resolution front-facing camera? Not in this case. It features 5 megapixels. The front-facing camera also shoots decent pictures. There is a shutter delay and countdown when pictures are taken with the front-facing camera. The rear-facing camera even features 8 megapixels. Its pictures are also good. Also on the back: The decent speaker. There wasn't room for the buttons on the casing. 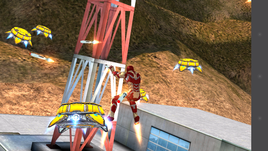 They are implemented as virtual buttons on the screen. 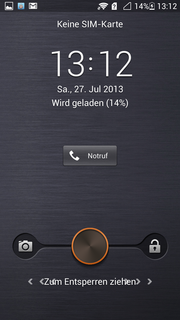 The so-called "Emotion UI" interface for Android already has a uniquely designed lock screen. It can be largely customized via themes. The app "Designs" has to be opened first. 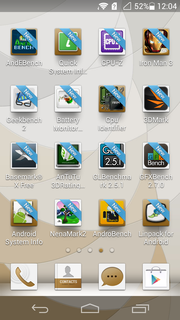 The icons for the preinstalled apps also change with the themes. Nice detail: New apps are marked with a banner. 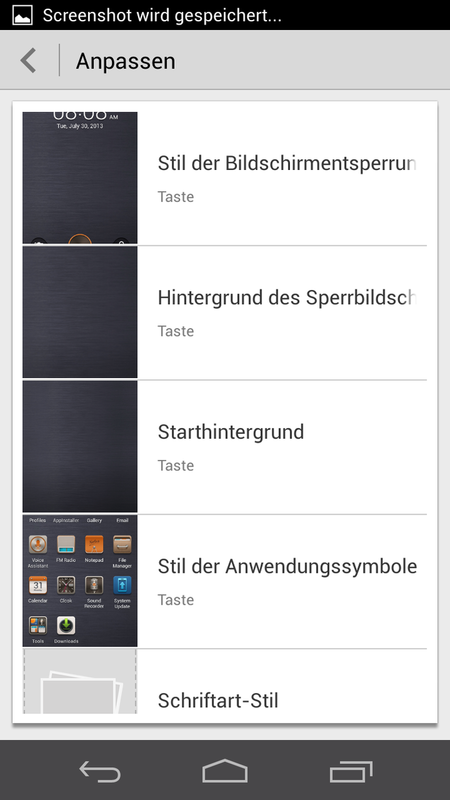 It is possible to create folders and categorize the apps. The centerpiece is this widget that can be extensively configured. This is the dark design. A personal design can be developed from single parts of the designs. The phone app doesn't quite fit to the design with its grass green dial button. However, it is very intuitive to use. 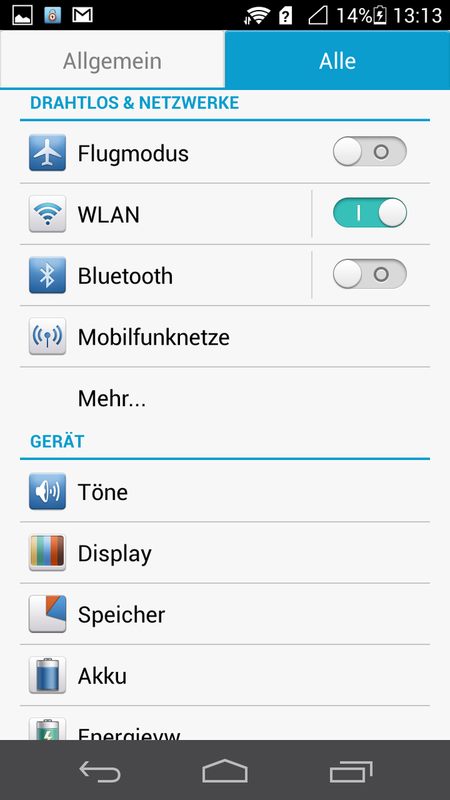 A tab dubbed "General" with frequently used options is found in the settings. The settings also offer slightly extended options. One example is the "Glove" mode that allows use with gloves. 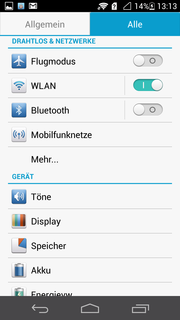 The quick access bar can also be customized. The power is only enough for games to a certain extent. The SoC is an older model. Thus, browsing on the internet is a bit slower than on more up to date phones. The screen's high brightness is convincing but it could have a higher resolution. Overall, Huawei's Ascend P6 is a very impressive phone. However, it lacks the final touch for the premium range. The very stylish design, the slim build, the aluminum chassis, the clearly arranged operating system. In a nutshell - quite a lot. LTE support, a higher resolution screen and a bit more power would have boosted the smartphone to the top. That Huawei's Ascend P6 puts the established competitors in an unfavorable light in some categories. Apple iPhone 5, Google Nexus 4, Sony Xperia T, Sony Xperia Z, Sony Xperia ZL, LG Optimus G, HTC One, Nokia Lumia 820, Samsung Galaxy S4, Samsung Galaxy Express.